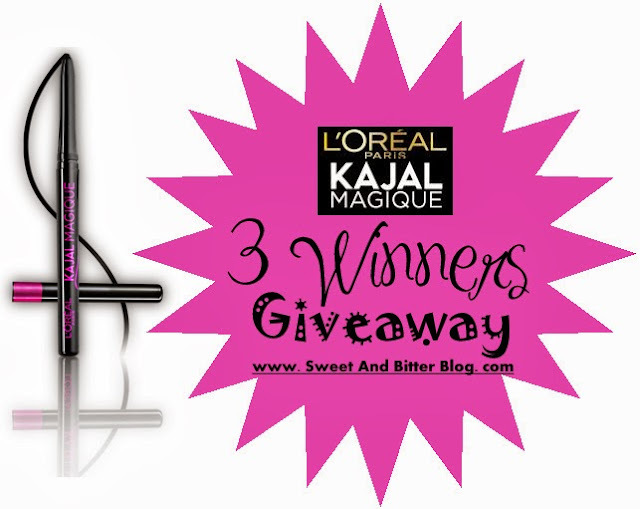 [3 Winners Giveaway] Share Your Magique Moment and Get the NEW L'Oréal Paris Kajal Magique! At Sweet And Bitter Blog, let's start the new year with a great note. Here is a way three winners from India can win the new L'Oréal Paris Kajal Magique! What is so different about Kajal Magique? 1. Share with us your Magique Moment! Something that might have changed you, something that you might never forget, something that you might tell your children, something that will put a smile on your face when you are old with no teeth! LOL. Share THAT moment with us in comments below. If you are not able to comment in G+ then please post your comment on Facebook (link). 2. Like Sweet And Bitter Blog on Facebook Page and share your FB name in comment. The giveaway ends on 7th Jan 2014 and is India only! Disclaimer - L'Oréal Paris will be directly sending the winners the L'Oréal Paris Kajal Magique.